The author is assistant professor in the nutrition, dietetics, and food sciences department at Utah State University. Numerous studies have revealed that the beef finishing diet prior to harvest impacts meat quality. Specifically, diet is believed to influence the amount of intramuscular fat (marbling) and ultimately beef eating quality. Changes in beef fatty acid composition occur as intramuscular fat content changes because of the preferential deposition of saturated and monounsaturated fatty acids (SFA and MUFA) following rumen biohydrogenation. Additionally, as intramuscular fat accumulates, there is also a tendency among polyunsaturated fatty acids (PUFA) to be composed of more Omega-6 fatty acids compared with Omega-3. Human diets having greater ratios of PUFA to SFA (>0.45) and lower ratios of Omega-6 to Omega-3 (<4.0) may reduce the incidence of coronary artery disease. 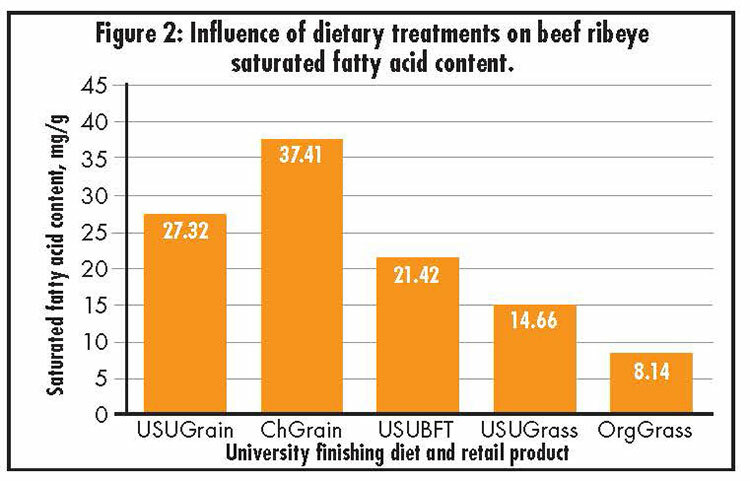 Previously, forage-finished beef has been concluded to have comparatively greater nutritional value due to favorable ratios of PUFA:SFA and Omega-6:Omega-3 fatty acids. Feedlot finishing is known to provide an abundance of dietary carbohydrates and thus marbling is accumulated. Forage finishing by comparison rarely yields carcasses with high amounts of marbling. This tendency toward lower marbling is believed to be partly due to the lower amount of dietary carbohydrate found in most grasses. In a study conducted at Utah State University, forages were explored that provided a range in dietary carbohydrate. Three groups of cattle were provided different finishing diets during the last four months of production up until harvest. The first group was provided a typical feedlot ration (USUGrain), the second grazed the legume birdsfoot trefoil (USUBFT), and the third grazed meadow bromegrass (USUGrass). Feed dietary composition and carcass composition of the university cattle were evaluated. Additionally, ribeye rolls were retained for meat quality evaluations. 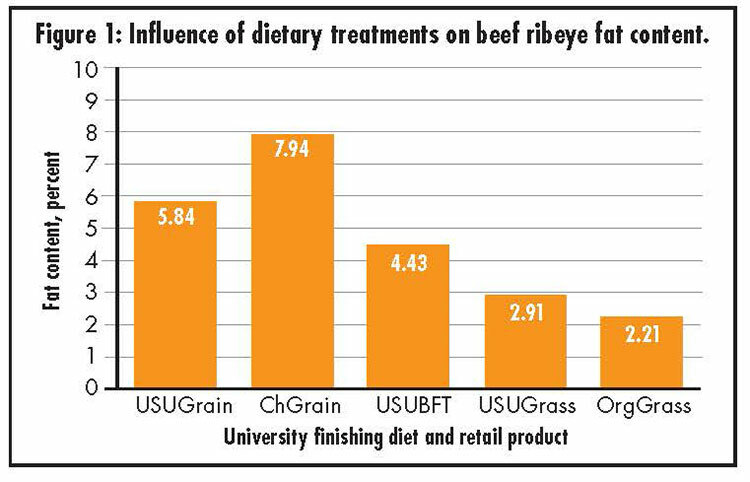 To understand how the university-produced cattle would compare with retail beef, USDA Certified Organic Grass-fed (OrgGrass) ribeye rolls and feedlot-finished USDA Choice (ChGrain) ribeye rolls were purchased. Ribeye steaks were produced and evaluated by consumers for sensory properties, total fat content, and fatty acid content. 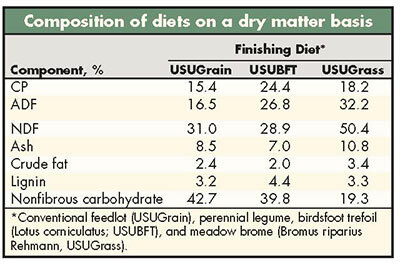 Interestingly, the nonfibrous carbohydrate (NFC) level of the feedlot ration and birdsfoot trefoil was comparable and greater than meadow brome (see table). This provision of dietary carbohydrate was determined to impact many meat quality factors. However, final marbling score did not differ due to diet. This is in contrast to previous studies that showed marbling to be altered with diet. However, visual assessment of marbling is a subjective measure and other indicators of carcass fatness (fat thickness; kidney, pelvic, and heart fat) revealed that diet did have an impact on carcass fatness in this study with USUGrain and USUBFT being comparably greater than USUGrass. Among ribeye steaks, fat content was greater for grain-finished (ChGrain) than all grass-finished beef and USUGrain (Figure 1). 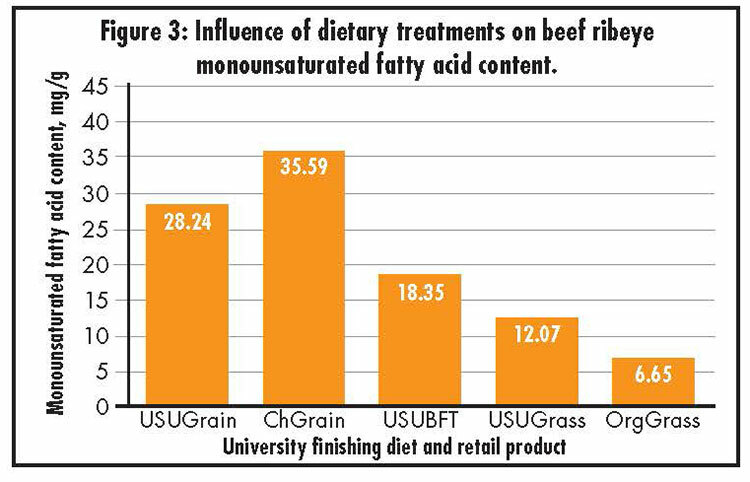 Among the USU-finished beef treatments, the fat content of USUBFT was intermediate to USUGrain and USUGrass. The elevated fat content concentration of birdsfoot trefoil-finished beef is of interest due to the well documented impact of fat content on palatability. When ribeye steaks were evaluated by consumers, USUBFT was determined to have comparable tenderness, juiciness, and overall liking with grain-finished beef. Meanwhile, each of the grass-finished beef (USUGrass and OrgGrass) were determined to be liked less by consumers for all attributes in comparison with grain-finished beef. Among attributes, flavor liking was the only attribute where USUBFT was not at least comparable with grain-finished beef. This result is of interest due to the well documented impact of forage finishing on flavor-contributing fatty acids. Considering the impact of diet on both fat content and beef palatability, there were specific links with beef fatty acid content. As previously described, changes in marbling content occur primarily through higher amounts of triglycerides during animal finishing. Furthermore, there is a propensity for greater accumulation of SFA and MUFA within beef triglycerides as overall marbling improves in comparison with PUFA. In this study, grain-finished beef had greater fat content (Figure 1) and greater cumulative SFA and MUFA compared with grass-finished (Figure 2 and Figure 3). Similar to overall fat content, cumulative SFA and MUFA of USUBFT was intermediate to the USUGrain and USUGrass treatments. With regard to sensory perception, concentrations of SFA and MUFA have been positively correlated with desirable beef flavors. In contrast, an elevated proportion of Omega-3 fatty acids have been shown to increase undesirable off-flavors in beef. The results of this study would support these previous conclusions, where forage-finished beef had lower flavor liking and less SFA and MUFA concentrations while having greater proportions of Omega-3 fatty acids. Although additional amounts of Omega-3 fatty acids may negatively influence flavor, greater amounts of Omega-3 fatty acids help maintain lower ratios of Omega-6:Omega-3 fatty acids and can have positive health impacts. 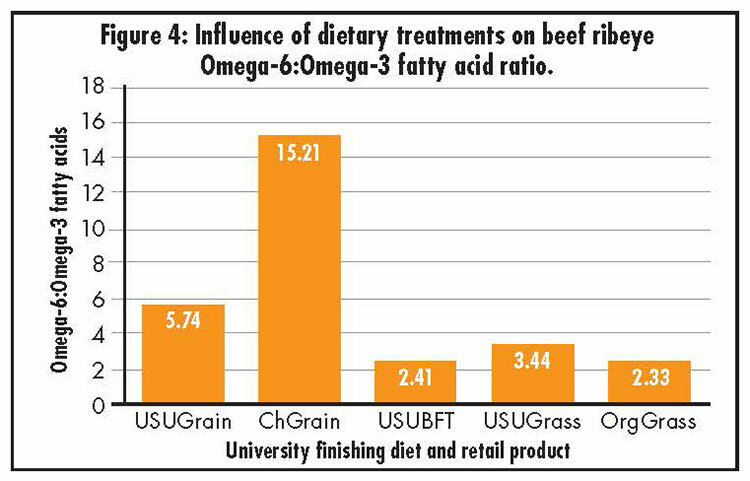 Ratios in the forage-finished beef treatments, including USUBFT, were all less than the recommended 4.0, whereas the grain-finished beef ratios each exceeded 4.0, particularly the purchased beef, ChGrain, which had an Omega-6:Omega-3 fatty acid ratio greater than 15 (Figure 4). This result indicates that while USUBFT shared SFA and MUFA similarities with grain-finished beef, the Omega-6:Omega-3 ratios of USUBFT were at a positive dietary level. The results of this study support the conclusion that cattle finishing diets impact beef quality, where grass-finished beef is generally lower in fat and less liked by consumers compared with grain-finished beef. However, this study reveals that not all forages are equal. The relatively high concentration of NFC in the legume birdsfoot trefoil compared with meadow brome appears to have boosted fat content and altered consumer perceptions. The tenderness, juiciness, and overall liking of birdsfoot trefoil-finished beef was equivalent to grain-finished beef. Meanwhile, the important dietary characteristic of Omega-6:Omega-3 for birdsfoot trefoil-finished beef was more favorable compared with grain-finished beef, and comparable to grass-finished beef. These results demonstrate an opportunity for producers to follow a forage-finishing program while maintaining beef eating quality comparable to grain finishing programs. This article appeared in the August/September 2016 issue of Hay & Forage Grower on page 22 and 23.